This policy refers to all companies of Giant Partners, Inc. (“GP”), and its customers who provide any information (“Data”) to us. GP is committed to ensuring that all Data handled by us will be processed according to legally compliant standards of data protection. Client Data is never shared or sold. Giant Partners uses voluntarily submitted client Data to build lookalike audiences to model consumer profiles for list generation. 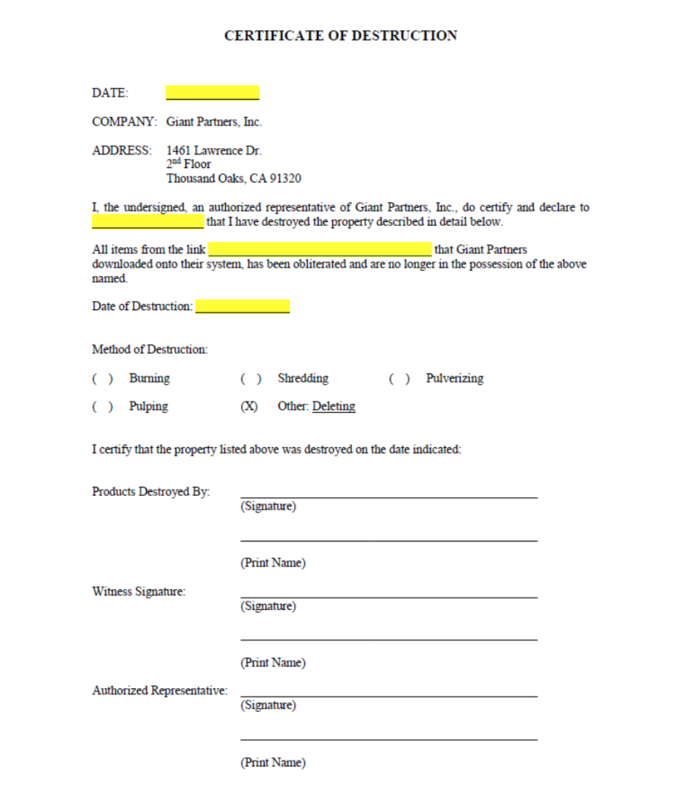 Once a project is complete, a notarized “Certificate of Data Destruction” is available upon request. Firstly, some clients require a Non-Disclosure Agreement (“NDA”), in which GP will provide a copy of their NDA, where both parties will execute. Some clients wish to send their data directly to their GP sales representative via email. GP has a proprietary dashboard available only to its employees, where the client’s sales representative will log in to, and they will click the “upload link” function. The sales representative will then fill out the form and a link will be sent to their client’s email address. This link is a private upload page that is available for only 24 hours. Once the client sends the information via the link provided, GP’s processing team will get a notification that the Client has sent their data. One of the data processors will then send an email to the client’s sales representative notifying them that GP is in possession of the Data. Once the sales representative has given instructions on how the processing team needs to fulfill the order, processing then goes into Amazon S3 and download the Data to a secure server. Once the data processor has downloaded Data onto the secure server, the data processor will at this point, add any appends needed for the client’s Data. The Data is then address standardized. Used to model a lookalike audience for the client.